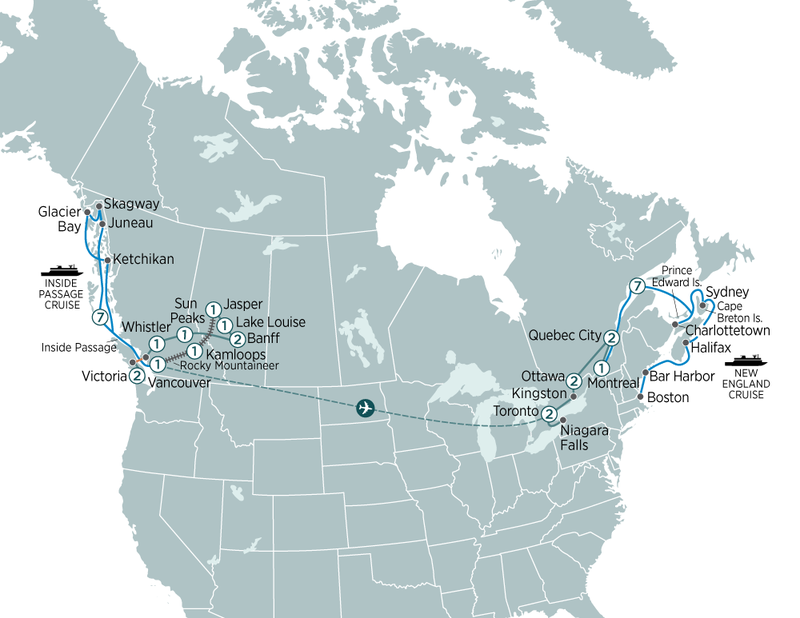 This journey will take you through the spectacular Rocky Mountains, Icefields Parkway, Alaska's infamous Inside Passage, Ketchikan, Niagara Falls & more! After breakfast drive north along Vancouver Island to Nanaimo. Board the BC Ferry and travel through the Georgia Strait to Horseshoe Bay. Journey inland along the Sea to Sky Highway as the road follows the rugged coastline with views of Horseshoe Bay on your left and forested parks and mountains on your right. You will have the chance to stop at the awesome Shannon Falls before arriving at the charming alpine resort of Whistler Village. This evening you are free to explore the village’s cobbled pathways and plazas. Discover More: Undertake a bear viewing tour with a local expert, or have dinner with a twist on a tasting tour. Travel along the scenic Duffy Lake Road lined with thick forest, into the town of Lillooet. In the afternoon head into the mountains to the picturesque ski resort village of Sun Peaks. You’re Invited: This evening our highlight dinner involves an authentic Fur Traders presentation and feast. This morning we travel north along the Icefields Parkway, acclaimed as one of the most spectacular journeys in the world. Enjoy breathtaking mountain scenery as you pass rugged peaks and glaciers fringed by thick forest and shimmering lakes. We make a stop at the Columbia Icefield, North America’s largest sub-polar ice pack, where you’ll climb aboard the ‘Ice Explorer’ for a once-in-a-lifetime journey onto the mighty 300 metre thick Athabasca Glacier. The day’s end finds us in Jasper National Park, an alpine wonderland of pristine wilderness and abundant wildlife. Be taken through the park to the beautifully carved Maligne Canyon. You’re Invited: This evening we journey to Jasper Stables at the foothills of Pyramid Mountain and experience an authentic Canadian Rockies Western style dinner §. Set off on a two day rail experience on “The Most Spectacular Train Journey in the World”. Settle back in your SilverLeaf carriage (upgrade to GoldLeaf at additional expense). Enjoy incredible views of the soaring mountains including Canada’s highest peak, the awesome 3954 metre Mount Robson as you journey towards Kamloops. Continue your journey on board the Rocky Mountaineer following the Thompson River and passing through the magnificent Fraser Valley. Late afternoon we arrive into Vancouver. Today enjoy a sightseeing tour of Vancouver including Stanley Park, the waterfront, Gastown and Capilano Suspension Bridge Park. Make your way across this spectacular suspension bridge, 70 metres above the Capilano River, and join the award winning Treetops Adventure along a series of elevated walkways. This afternoon head to Canada Place Pier to board your cruise ship. Check into your comfortable ocean view stateroom (upgrade to verandah stateroom additional expense) on the luxurious Holland America Cruise Ship ms Nieuw Amsterdam or ms Volendam and settle-in for an unforgettable 7 night voyage through the famed Inside Passage. Spend the day cruising the Inside Passage, one of the world’s most spectacular waterways passing forests, mountains, islands and inlets. Today is a day of relaxation. Take advantage of the ship’s many outstanding facilities, or simply relax on deck with a drink and watch unmatched scenery glide by. Disembark early this morning and transfer to Vancouver Airport to board your flight to Toronto (flight not included in land only bookings. Book flight after 12:30pm).